Parental attitudes have such a great bearing on nutritional behaviour, it is vital to foster a preference for healthy foods in the most effective manner. Coercive feeding and restricting access to specific foods should be avoided, since they can lead to a greater interest in forbidden items, as well as to overeating. From the time we begin preparing baby’s first foods, we hear of the importance of serving up a wide variety of flavours, textures and colours, in an aim to wake her up to the wonderful world of food. Studies have shown that dietary habits acquired in childhood last way into adulthood, so it is important to ‘get it right’ from the world go. An interesting study published in the British Journal of Nutrition, however, points out that what we offer our kids is just one part of establishing healthy eating habits; our attitudes to food and our parenting style, can also play an important role in ensuring children build a positive relationship with food for the rest of their lives. The study focused on two aspects of food control: restriction (the extent to which parents control junk food intake and total amount of food consumed by children) and ‘pressure’ (the extent to which kids are pressured to enjoy healthier foods, such as fruits and vegetables, and the pressure to eat more). The results of the study showed a strong relationship between parental attitudes and the child’s satisfaction or dissatisfaction with their bodies, as well as the risks of disordered eating, overweight and eating disorders. The results of the study showed a strong relationship between parental attitudes and the child’s satisfaction or dissatisfaction with their bodies, as well as the risks of disordered eating, overweight and eating disorders. Researchers found that ultimately, being a positive role model was more effective than strictly controlling a child’s diet. They noted that restricting food (both in terms of quantity and types of food) had both short and long-term effects on children’s preferences. In the short-term, it enhanced preference and increased attention and intake, while in the long term, it increased intake and eating in the absence of hunger and ultimately, weight gain when children were older. Pressuring a child to eat more also has negative consequences, since it lessens their ability to regulate their own energy intake. One study actually shows that it results in lessened fruit and vegetable intake in five-year-old girls. Even rewarding children for eating healthy foods such as vegetables, can ultimately reduce their liking for the very foods we are trying to encourage them to eat. Researchers noted that well-intentioned parents can assume that their children need help in determining what and how much they should be eating, which may ultimately deprive children of opportunities for self-control. Needless to say, an excessive encouragement of weight loss, and even an excessive preoccupation with weight and eating, can put (especially) female children at a risk for eating disorders when they are older. Because parental attitudes have such a great bearing on nutritional behaviour, it is vital to foster a preference for healthy foods in the most effective manner. Coercive feeding and restricting access to specific foods should be avoided, since they can lead to a greater interest in forbidden items, as well as to overeating. Even rewarding children for eating healthy foods such as vegetables, can ultimately reduce their liking for the very foods we are trying to encourage them to eat. One of the best ways to teach children about healthy eating is by example. In previous studies, children who eat with their parents are more likely to have a higher fruit and vegetable consumption. Children should not be forced to eat more than they can. Parents should provide a wide array of nutritious foods instead of unhealthy junk foods. High sugar foods and juices should be limited. Children with a normal BMI should be allowed to regulate their own caloric intake. Children should be served portions which are appropriate for their age and activity levels. 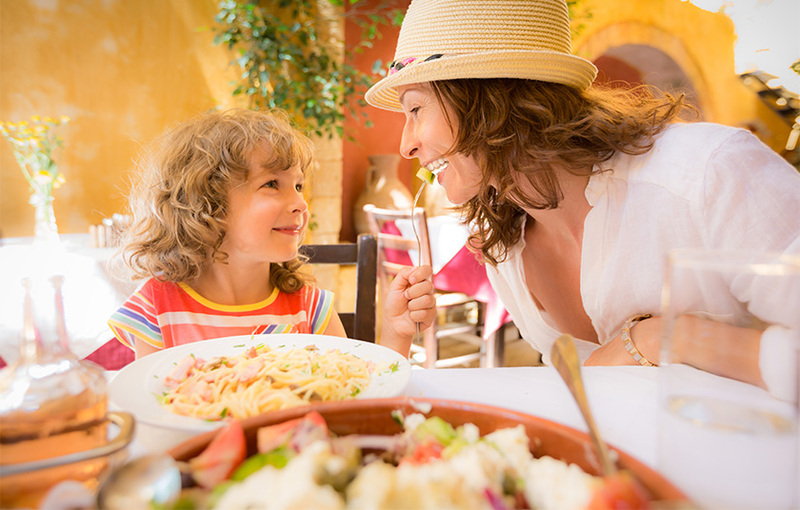 The family should enjoy meals together, so children can learn to eat healthy foods by watching their parents enjoying these foods on a regular basis. Children should have many opportunities to try new foods, though parents should understand that children will often have a fear of trying new things. Repeated exposure to the same new foods will increase the chances of a child wishing to try it. Food should not be used as a reward, and unhealthy (processed and high sugar foods, and foods made with trans fats) should not be part of celebrations. S Scaglioni et al, Influence of parental attitudes in the development of children eating behavior. British Journal of Nutrition, 2008. 99(1):S22-25. P Jansen et al, Children’s eating behavior, feeding practices of parents and weight problems in early childhood: results from the population-based Generation R Study. International Journal of Behavioral Nutrition and Physical Activity, 2012. 9: 130. Bulimia, Topics for Parents and Families, accessed May, 2015. Naeyc.org, The Impact of Teachers and Families on Young Children’s Eating Behaviors, accessed May, 2015. Washingtonpost.com, Teaching our kids healthy eating must start early, accessed May, 2015. Childrensheartcenter.org, Why Is Nutrition Important for Children, accessed May, 2015.